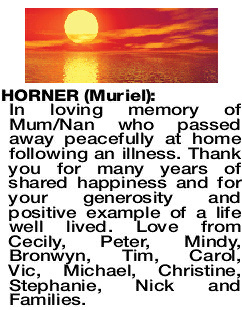 In loving memory of Mum/Nan who passed away peacefully at home following an illness. Thank you for many years of shared happiness and for your generosity and positive example of a life well lived. Love from Cecily, Peter, Mindy, Bronwyn, Tim, Carol, Vic, Michael, Christine, Stephanie, Nick and Families. The Funeral Service for the late Mrs Muriel Catherine Horner of Claremont will be held at Dalkeith Baptist Church, 123 Waratah Ave Dalkeith on THURSDAY (04.04.2019) at 10.00am. A Burial Service will be held at PINNAROO Valley Memorial Park Cemetery, Whitfords Ave, Padbury at 1.15pm.